Being an engineer by trade I frequently use my understanding of mechanics to get the most power and efficiency from my techniques. It also helps when trying to explain to students the reasons for specific techniques. I have even found that with simple demonstrations even children can understand the basic mechanics of different techniques. I have found that when the students can relate the techniques to an understandable physical principle their learning is enhanced over just being told to do it because that it the way it is done. Although the applications of physics principles are readily apparent in striking techniques they are a little more difficult to see in blocks and throws. In the case of a hand strike or a kick the desire is to impart the maximum amount of kinetic energy into the target. This should not be confused with force. Force comes into play because it is required to accelerate the striking implement to a velocity which when it comes into contact with the target will impart its energy. In a sense the striking implement, hand or foot, is a kinetic weapon in the same sense as a bullet or a rock. Or mass times velocity squared divided by two. This means that if you double the velocity of your technique you increase the energy by a factor of four. So even if you could double the mass of your fist you would only double the energy. The math is very simple but when as martial artists we try to take advantage of it the implementation is more difficult. As various martial arts evolved the techniques developed that took the most advantages of the physics. In some cases it might have been a scientific process but there was probably a lot of trial and error and just plain accidental discovery. The next question is where exactly does the force come into play? The answer is that we use the force of our muscles to accelerate our striking implement to the target. The human body is an amazing conglomeration of actuators and levers and pulleys all combined to provide the most complex types of motion. As a muscle contracts it applies force to the skeletal structure causing the desired movement. The greater the and faster the applied force the greater the acceleration of the striking implement. The greater the acceleration the faster the velocity increases and the faster you close the distance to the target. The first graph below shows the difference in the velocity behavior when the applied force is doubled. The units are purely arbitrary and are only meant to show the relationship between the two situations. As you can see at any point in time the object being applied double the force has double the velocity of the first. This means that it also has four times the kinetic energy and the increased effect upon impact. This is only part of the benefit. 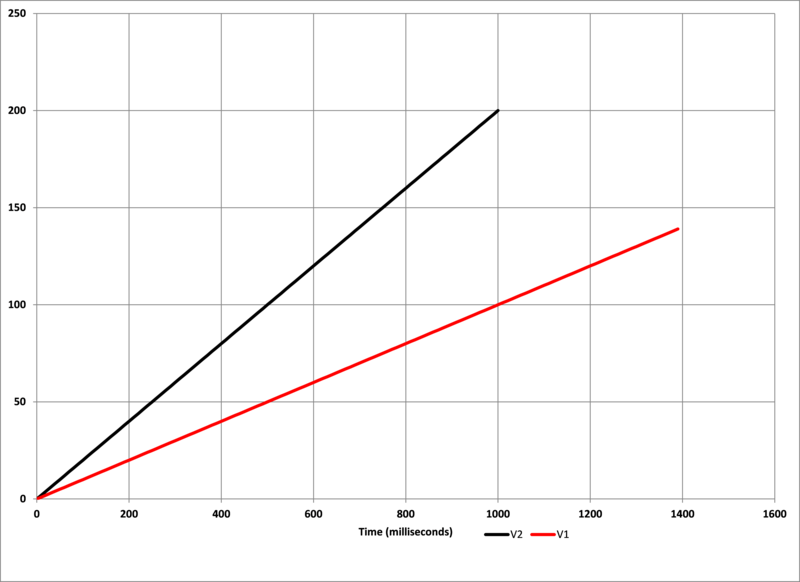 By increasing the velocity at a greater rate the time to the target is reduced. I a sparring or combat situation this is a benefit because it gives your opponent less time to react to your technique. 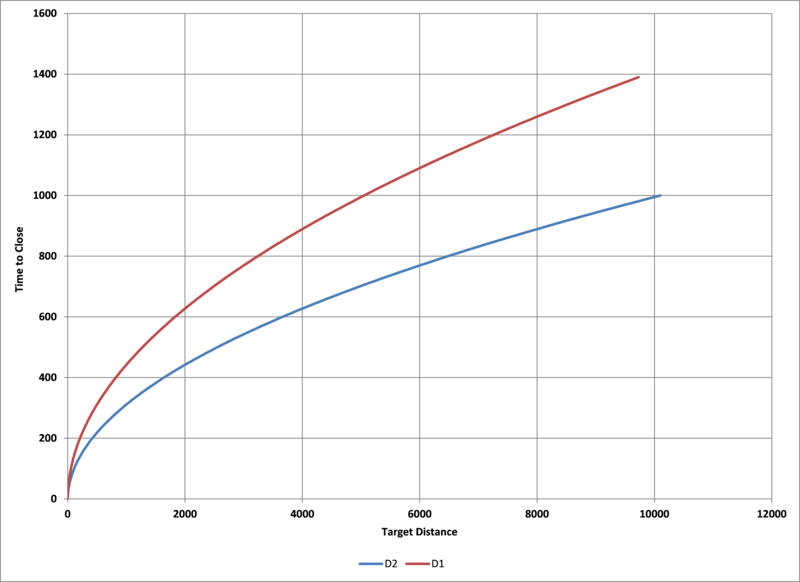 The second graph shows the difference in the time it takes to close on the target between the two cases. Figure 1 – Relative Speed Resulting from Doubling Force. This is all intuitive. It is common sense based on normal observation that faster is better. Looking at the mathematics of it quantifies the information and shows that the benefits are more than intuition would imply. The obvious decision would then be to greatly increase muscle to be able to apply more force. This is correct to a point but eventually you reach a point of diminishing return. If you get too big and bulky your strength will become offset by your increased mass when attempting some techniques. So the best tack is to balance strength with flexibility if the desire is to have a balanced all around capability. Of course this is easier said than done. With the vast differences in body types and other physical attributes practitioners will have to decide for themselves what works best for them and how to make the most of their abilities. No matter what a practitioners capabilities there are physical and mental techniques that can be cultivated to improve their speed and power. As mentioned before stronger muscles can increase speed but just as important is the how the muscles are coordinated. The first thing is to be relaxed prior to initiating a technique. If your muscles are tense they will not respond as quick. Additionally human musculature is set up such that the muscles are in pairs that oppose each other. To cause a specific motion one muscle has to contract but at the same time the opposing muscle has to relax. For optimum reaction all of the muscles should be relaxed and the necessary muscle should be contacted as fast as possible to generate explosive power. In the Chinese arts this is referred to as FaJin or more commonly, and erroneously FaJing. The desire is through proper practice to develop the required timing and coordination to keep the muscles relaxed and explosively contract the muscles necessary to perform the desired technique. This is true not only of strikes but also blocks and even throws. In the case of a simple motion, such as a simple straightening or bending of the arm pretty much only two muscles are involved and the coordination is relatively simple. However, any real technique involves multiple muscles and requires more complex coordination in a manner termed kinetic linking. In the following sections this will be described in relation to various motions.